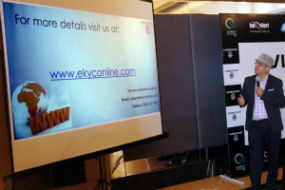 Videocon Telecom has announces its entry into E-KYC business to provide Aadhaar based digitization. eKYC is a government approved online verification process for fulfilling KYC requirements of any organization. The service shall be either authentication or verification in nature as per requirements of any organization. The company has partnered with globally renowned technology partners to provide end to end solutions to cater current and future business needs. Most companies registered with UIDAI are using it for captive use, wherein Videocon Telecom aims to digitize all key sectors namely Finance, Insurance, Hospitality, Education etc. Company also announced in the release that It will also help government organizations to have Aadhaar based attendance at highly sensitive places, curb attendance frauds in organizations at remote locations, and will also ensure that schemes like mid day meals and other subsidies are going to the right beneficiaries. The company, backed by its rich experience in Telecom and IT services, an in-house DATA Center, strong Technology partners will provide personalized solutions to each sector. Videocon Telecom has obtained both the required licenses, ASA and AUA for the Aadhaar based validation. The Company will act as the link for an individual’s registration process with UIDAI and take one through the registration process without any hassles. Videocon Telecom would assist in providing the services, which will cover business process re-engineering, secure environment and automated process flow thereby creating value for each user. "Digitizing India is the only sure-shot way to reach the benefit of growth to India’s masses and that will create the multiplier to ensure the target 8 to 10% sustained GDP growth. Digital India is certainly the most appropriate call for transforming India into a vibrant and strong global economy.We believe that Digital India has the potential to become one of the most meaningful reforms for Indian businesses in recent history.”, Videocon Telecom CEO, Mr. Arvind Bali, told.